Savannah's Candy Kitchen catalog has been busy whipping up homemade fudge, cakes, cookies and brownies that sweet-toothed customers have been sinking their teeth into while always coming back for more. Internet baked goods are even more delicious with our tasty coupon code savings. Gift baskets and towers - Money can't buy happiness, but fresh baked goods can! Find the best all occasion and holiday gift baskets online at Savannah's filled with the richest, most scrumptious goodies. From homemade fudge to pecan log rolls, you'll be smothered in tons of tasty sweets to choose from. Featuring a unique holiday gift basket collection and other yummy snack baskets, give the gift of goodness that keeps on giving. Plus, if it's a Savannah's gift basket, count on it to be an affordable gift basket. Original pralines - All pralines are not created equal. There's no confusing these light, delicate Pecan Pralines with their western cousins from Louisiana or Texas. Savannah's Original Pecan Pralines are light and creamy, hand dipped, wrapped and packed in their signature red gift boxes. Choose from the Originals, their southern inspired Praline Pecan Pound Cake, or their can't-have-just-one Praline Brownies. Some say the proof is in the pudding, at Savannah's they know the proof is in the praline. Cakes and pies - Marie Antoinette said it best, let them eat cake! Consider Savannah's Candy Kitchen the ace of cakes when it comes to the most delicious cakes in cyberspace. Finding it impossible to recreate your Grandma's famous lemon cake recipe? No sweat, order a deliciously glazed lemon bundt cake fresh out of the oven from Savannah's. Choose from their celebrated Praline Pecan Pound Cake, Emily's Sour Cream Pound Cake, Coconut Cake, Strawberry Layer Cake, Pecan Coffee Cake or Christmas cakes that all take the cake! Did I mention the pie? Their Southern Pecan Pie is the best pecan pie the state of Georgia has to offer! Corporate gifts - Looking for a raise? Order your boss a gourmet chocolate corporate gift basket in the form of a five story tower of Savannah's best selling milk chocolate gophers, assorted gourmet chocolate truffles and other mouth watering treats. You won't find gift baskets and towers like these anywhere except straight from Savannah Candy Kitchen's oven. Find kitchen-fresh delicacies that are perfect for everyone on your gift list - employees, customers, key vendors or board members. Whatever the occasion or season, Savannah's has a gift that's good enough to eat. Whether you need gourmet fudge, glazed pecans, a candy gift basket for a loved one's birthday, or a unique holiday gift basket for the in-laws, you'll find an affordable gift basket that is perfect for any and every occasion. 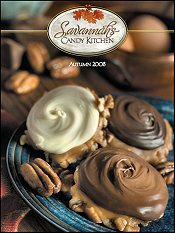 Home of the Original Pralines, count on the most delicious and affordable baked goods - from Savannah's Kitchen to yours.